Many a time we come across a scenario where we pass a comma or any other character delimited string to stored procedure and in stored procedure we want to fetch data from other tables based this delimited string. We can’t use this delimited string directly in the in clause as Sql treats it as one string. So, the solution for this is to get a table by splitting the delimited string by the delimiter character and then join this resultant table data with other table columns. In Sql Server we have mechanism where we can take table as a input parameter from the application code. 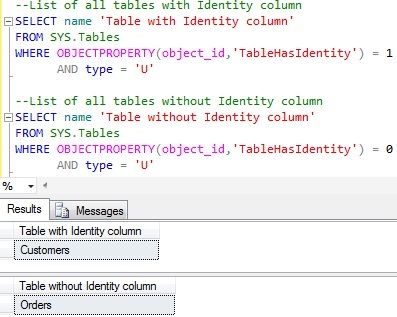 So if you like to pass a table from your code with multiple rows instead of passing a delimited string to stored procedure and splitting it in SP, then you may like to read the article Table-Valued Parameters in Sql Server. But I would prefer passing the comma delimited string to stored procedure and split it in the SP. Below example shows how we can use STRING_SPLIT function to splits the comma separated string. We can crate a table valued function like the below which is using WHILE loop and Sql String functions like CHARINDEX and SUBSTRING to split the string. This should work in all the versions of Sql Server. We can crate a table valued function like the below which is using Sql XML feature to split the string. 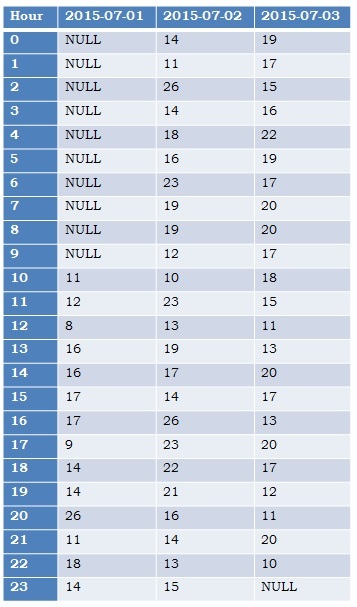 This article demonstrate how to get yearly data in Sql Server in different formats as shown in the below image. 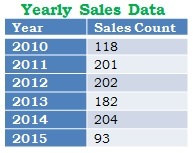 Here Sales table data is presented in two different yearly aggregated sales data formats. Let us create a Sales table and insert 1000 Sample Sales Records With Random sales date in the past 5 years using the below script. Problem with Demo 2 approach is , it is using the static PIVOT to get the data. Which requires the developer to specify all the years as the pivot columns manually. We can re-write the Demo 2 examples by using Dynamic pivot approach as below which doesn’t require the developer to manually specify the years column. This article demonstrate how to get daily data in Sql Server in different formats as shown in the below image. 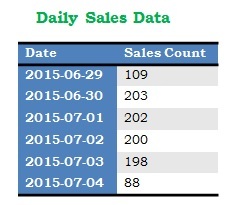 Here Sales table data is presented in two different daily aggregated sales data formats. Let us create a Sales table and insert 1000 Sample Sales Records With Random sales date in the past 5 days using the below script. Problem with Demo 2 approach is , it is using the static PIVOT to get the data. 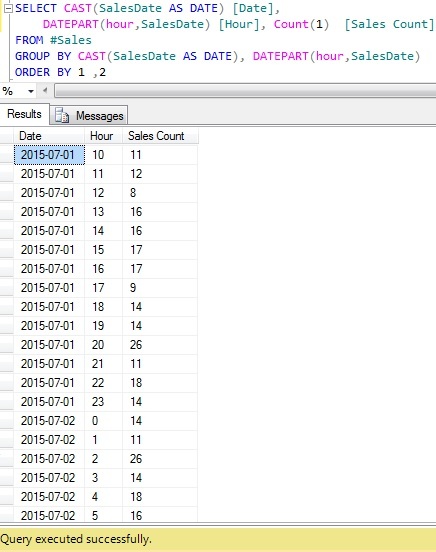 Which requires the developer to specify all the dates as the pivot columns manually. We can re-write the Demo 2 examples by using Dynamic pivot approach as below which doesn’t require the developer to manually specify the dates column. This article demonstrate how to get hourly data in Sql Server in different formats as shown in the below image. 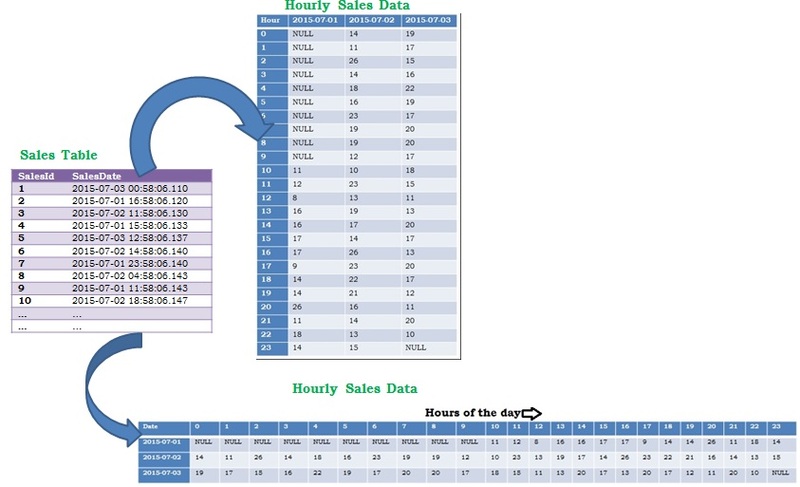 Here Sales table data is presented in two different hourly aggregated sales data formats. Let us create a Sales table and insert 1000 Sample Sales Records With Random sales date in the past 60 hours using the below script. Problem with Demo 2 approach is , it is using the static PIVOT to get the data. Which requires the developer to specify all the dates or hours as the pivot columns manually. We can re-write the Demo 2 examples by using Dynamic pivot approach as below which doesn’t require the developer to manually specify the dates/hours column.